"Scrub on a Hill", oil on canvas, 36"x36"
My latest painting "Scrub on a Hill", attempts to literally upend the conventions of landscape painting by forcing a dynamic of vertical movement. Landscape, by definition, infers a horizontal axis; hence, the computer matrix "landscape/portrait formats. But my objective in this painting is to move the viewer through and upward rather than across the space. I first squared the composition in order to equalize the vertical and horizontal and then employed practically every pictorial device to emphasize the third dimension (depth) and upward thrust. These devices include linear perspective properties of scale and pronounced sight lines; atmospheric perspective properties of contrast and detail; drawing means of line, value and texture; and color properties of hue, value and temperature. Additionally, I borrowed a landscape design device of compartmentalizing the space into "rooms" in order to enhance spatial movement. The result is fairly quick movement from foreground, up and over the slight hill, and then reverse movement back and up to the clouds. The movement is quick but the air is thick; a hot summer atmosphere. This is the full, deep, relentless green of mid-summer: nothing like the broad color range of my usual late fall/early spring landscapes. And this was the most difficult aspect of the painting. Green paintings are the most difficult which is why there are so few of them. The great landscape painters like Corot, Inness, and Welliver employed green very sparingly and never produced green paintings. The greatest painter of green, Henri Rousseau, created surrealistic dream-like images, capitalizing on green's psychological qualities. This is the approach taken by Gillespie and Kelly more recently, which I have sometimes tried to emulate in some of my figure paintings. Green is so difficult to depict, especially in direct observation, because it doesn't exist. What we perceive as green is really variations of yellow and blue. And those perceptions are determined by the type of red (orange, red, violet) next to it. It is impossible to depict green with green pigment. I am particularly happy with the title, "Scrub on a Hill". I have an on-going argument with my colleague, Jacob Stanley, on the purpose of titles. He believes in the importance of titles as qualifier while I insist their role be limited to identifier. I am a strong believer that the image needs to stand on its own and is deficient if it needs to be "completed" with words. Titles should act as descriptions to aid in the identification of individual works: the exasperating "untitled", of course, should be avoided at all costs. Perfect titles include "Ocean Park #24", "Woman II", and "'61 Pontiac". ​Titles can be be evocative as long as the feeling/sensation is the same as the image and is not meant as an augmentation: see Richter's "January". Like "January", I think "Scrub on a Hill" is both descriptive and evocative. "Scrub" is such a great word! In horticultural terms, it describes untended and unwanted growth, the detritus of man's interaction with the natural landscape. That is very close to the underlying investigation (content) of all my landscape drawings and paintings. "Tracks" oil on paper 26" X 56"
My latest landscape painting, "Tracks", continues the investigation of how the character of the land is reflected in the remains of imposed activity - surface landmarks . It is an idea akin to empathizing with a painted human subject through awareness of the material qualities of the individual, including those physical elements like wrinkles and laugh lines that denote effects of time and exertion: one of the purports of my figure painting. In "Tracks", multiple directional lines move us across the landscape in order to explore the topography intimately. These lines are defined by natural (snow, cloud formations) and man-made (road, utility infrastructure) indicators, as well as a hybrid of the two (snow trapped in tire tracks). The objective is movement through space and time to connect with the landscape experientially, as opposed to passively and statically. Therefore, our understanding of the subject is expanded beyond mere appearance to include history and material singularities: the realities that make each subject truly unique. It is not a moralistic exercise on environmental stewardship: the objective is simply truth. untitled oil on paper 16" X 44"
In support of truth, there is something very unpicturesque in the Missouri landscape which is why it attracts me. It is not unbeautiful; just more hardscrabble than Iowa, Virginia, and Pennsylvania, and, in its laugh lines and wrinkles, clearly evokes the challenges of time. Rackstraw Downes is the king of the scrutinized landscape and another of my heroes. The man with the greatest name in art utilizes investigative painting to understand the nature of place. Painting solely by direct observation, Downes "sees" in his subjects the kind of historical and psychological mining usually reserved for portrait painting. 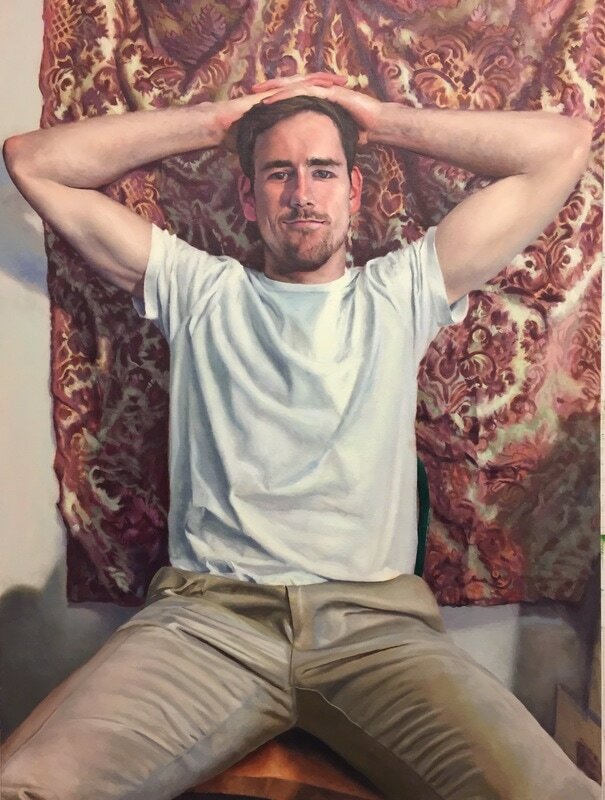 Like Lucian Freud, who spent 75 hours a piece with his portrait subjects, the longer Downes spends with his subjects, the greater our connection with them. He demands that the immediacy of his scrutiny take as long as necessary which affirms its timelessness. "As long as necessary" for Downes can mean weeks, months or even returning a year later when conditions are right to complete a painting. In the canons of modern art, this is another great hallmark of the perfect fusion of content and methodology. "Flip" oil on canvas 36" x 36"
My latest painting, "Flip", is a very definite depiction of the concept of the acrobat. 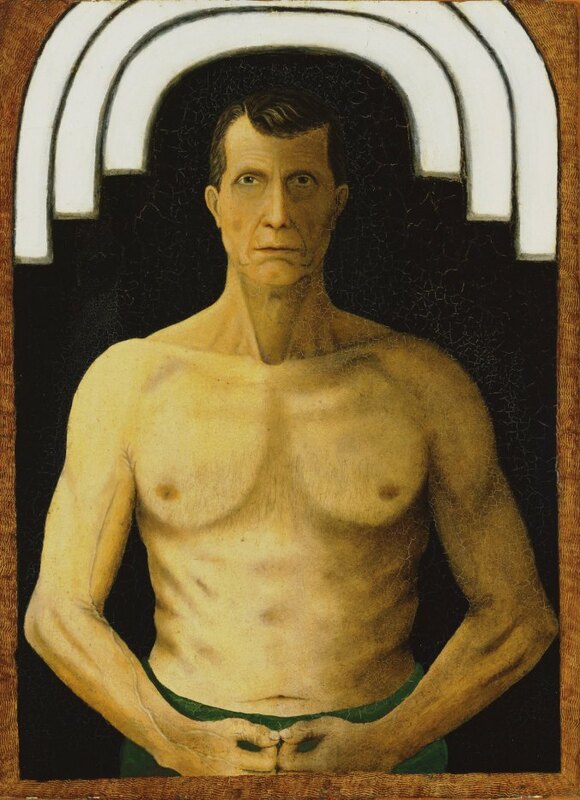 All of my figure paintings since graduate school have made reference to the acrobat, whether the overt subject be an athlete like John Kane or a saint like John the Baptist: the acrobat is always implied through pose, attitude and bearing. "John Kane" oil on canvas 48" x 36"
Saints and athletes are considerations of man at his positive pinnacles - morally for the saints and physically for the athletes. Of course, in my Jesuit humanist training, achievement of both physical and moral perfection is the ideal - the convergence of Spartan and Franciscan philosophies. That is why these guys are worthy of memorializing in paint; for while I am a realist in aesthetic temperament, I don't believe in the ordinary. The reality of the driven is worthy of our scrutiny. "St. John the Baptist" oil on canvas 48" x 24"
The acrobat, like the dancer and athlete, represents physical self-control for beneficial outcomes, but adds a bit of subversion suggesting something slightly untoward in its method: the acrobat asks the body to perform in quite unexpected and unnatural, yet titillating, ways. Therefore, the acrobat is a universal symbol for the inversion and reversal of established order. Distinctly anarchic. This is why the acrobat was a favorite subject for the modernist innovators like Degas, Picasso, Calder, and my beloved Walt Kuhn. They saw a reflection of themselves in their subjects and wanted to be recognized for the same daring, dangerous sensibilities, a connection contemporary artists are loath to relinquish. Last spring, I had the great luck to see Rudolf Stingel's exhibition at Gagosian Gallery in the Chelsea area of New York. Walking into the huge gallery was literally a breathtaking experience. On each of the four walls was one immense painting up to fifteen feet across of the Tyrolean Alps of Stingel's native Merano, Italy. More specifically, they were paintings of vintage and time-worn photographs or photographs printed from time-worn negatives. Because of the varied conditions of the supposed source, the five paintings of the exhibition (there was one smaller work in a side gallery) presented varying degrees of abstraction: one might have been titled "Mountains in a Blinding Blizzard". I was unfamiliar with Stingel's work but I became an immediate acolyte. The paintings are overwhelming and awe-inducing in scale, subject, and application and, most remarkably, as viewed from any distance. Whether seen from 100 feet away or right on top of them or any space in between, the paintings are both challenging and satisfying but always different, based on one's viewpoint. From afar, the toughness of the photorealistic precision is paramount while, closer up, the painterly intimacy is palpable. In between,they take the viewer to someplace otherworldly and exhilarating. Hence, they become the perfect paintings: always responding to the interaction of the viewer with expanding content. The viewer can't help but question and, therefore, become engaged with the process, further marrying the tenets of photorealism and action painting. I was excited to deduce that Stingel paints them "down" as we do scenery at the MUNY: canvas on the floor with the artist working on top. I spotted at least two footprints. Besides the over-sized photorealism, Stingel's oeuvre seems to be very eclectic and I haven't seen enough of it yet. A fascinating piece is his 2013 installation in the Palazzo Grassi Gallery in Venice, Italy, where he covered most public surfaces of the gallery with synthetic oriental carpet designs on which he judiciously hung abstract and photorealist grisaille oil paintings. I'm an art book and exhibition catalogue junkie and Gagosian offers a Stingel catalogue but I've resisted buying it: not because of the $80 price tag, but because of the anticipated disappointment. It is a testament to the purity of Stingel's painting that seeing them in reproduction does not appeal to me. The painting on the left is 131"x102". It is an arresting image in reproduction but I'm sure that what we see here is only a fraction of the aesthetic experience of seeing it in person: to view it not as the creator intended is to be deprived of the creator's aesthetic intent. That notion is true of all art, of course, but, in this digital age when the lines of visual truth are constantly being blurred, it is refreshing and reaffirming to see art, and specifically painting, that cannot and will not accommodate the capriciousness of technology. 1. Roberta Smith, "The Threads That Tie a Show Together: Rudolf Stingel's Carpeting Makeover in Venice", The New York Times, August 20, 2013 <www.nytimes.com/2013/08/21/arts/design/rudolf-stingels-carpeting-makeover-in-venice.html?pagewanted=all&_r=0>. Last spring, I saw the self-titled William Beckman exhibition at the Forum Gallery in New York. I have seen very few Beckman's in person and it was a thrill to study the approximately 20 paintings and drawings up close and in the privacy of the beautiful Forum Gallery. 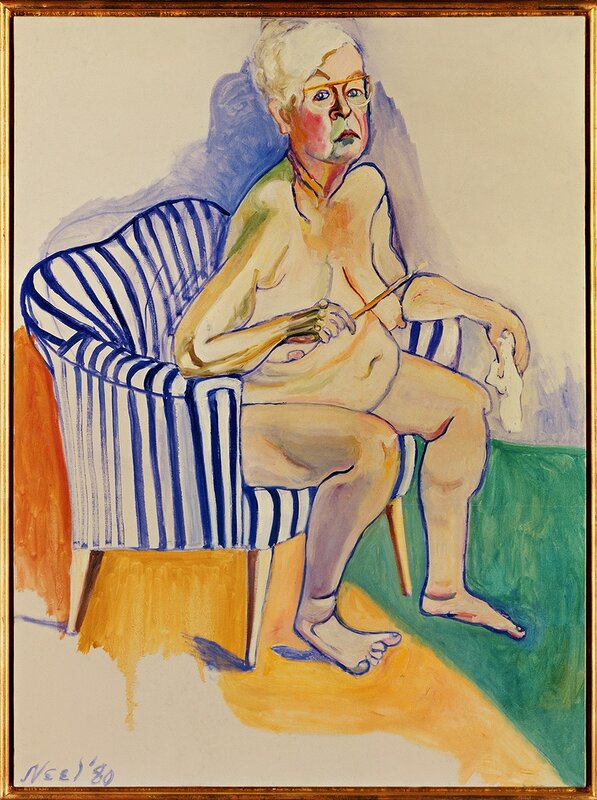 Represented in the show were his three primary subjects: clinical and direct bust portraits of himself and loved ones, female nudes in the artist's personal space, and healthy northern midwest farm-scapes. In over 30 years of working with the same subjects and themes, Beckman's oeuvre has changed little and a lot. He is still a formidable and demanding investigator of his subjects, exposing as much definition of their reality as possible. And while he is still an exacting draughtsman, he is less intent on depicting every facial pore and thread-count fabric as he is in mining the reality of the subject's presence. His work is, dare say, more abstract; he is more interested in the essence of the subject than the appearance, so we come to understand the subject by experiencing the solid plastic qualities of the head, for instance, or by the depth of the siena in the shirt. 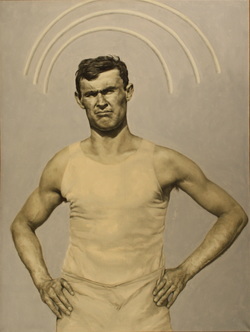 As with most mature artists, Beckman's work continues to evolve towards his aesthetic critical mass: the least amount of form required to express his unique content. Besides unnecessary detail, for example, his portraits are now almost totally void of environment - his subjects don't need context to exist, so he eliminates it. Some people miss the technical bravura of the detail, but it would be dishonest of him to retain something that didn't support his content just to demonstrate an exceptional skill. New to Beckman's oeuvre are the still life paintings of his palette environs. I'm not usually a fan of the artist's working environment as subject matter because it becomes too easily a metaphor for creativity. But here Beckman uses it as an investigation of the tactile. The subject transcends the appearance of paint tubes into the physicality of pigment and their constraints (tubes). We are less aware of the subject as tools of the painting trade and more concerned with them as unusual physical entities. Of special note (and, I'm sure, his aspiration) is that his coffee cans demand as much presence and gravitas as Jasper Johns'. Not necessarily new, but certainly evident in his new work, are homages to his friend, Gregory Gillespie. 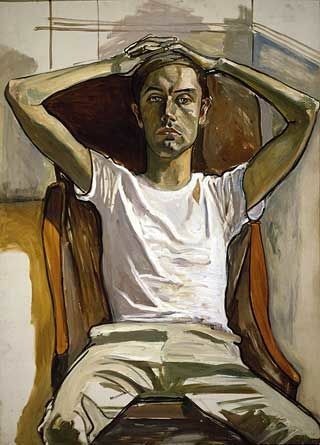 Beckman and Gillespie were good friends for many years: they painted each other's portraits and shared an intense interest in visual reality despite approaching it from very different directions. While Beckman's, as we said, is very clinical and detached, Gillespie's work was intensely psychological and surrealistic. While Beckman hides the struggle in his work, Gillespie exposed it. Gillespie committed suicide in 2000. It's interesting to see how artists are influenced by each other when we compare the works of two good friends. Direct visual references to Gillespie in Beckman's latest work include the use of masks, dimension coming off the canvas in the form of paint ooze and surface irregularities like wall punctures and screws, and heavy outlines in the still lifes. Gillespie used the latter two regularly (along with other devices) to upend the expectations of the illusionistic picture plane and question our conventions of reality.